No Child Left Behind requires schools to build relationships with the community in an effort to help every child learn to read. 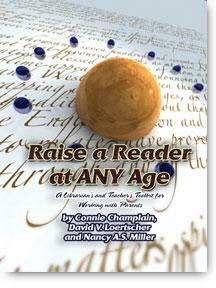 Raise A Reader At Any Age provides a toolkit with ready-made tri-fold and bi-fold brochures that librarians can print and modify, adding local information from a CD. These valuable brochures place the school and public library into a central role in literacy, showing parents how to use library resources for both children and teenagers. They show how to build avid and capable readers. The user must have access to Microsoft Word (any recent version). A quick and indespensible tool for working with individual parents, groups of parents, and doing teacher inservice.